Microsoft (MSFT) has good reason to be worried about Chromebooks, the cheap laptops that run Google’s (GOOG) Chrome operating system. Chromebooks cost a fraction of the price of laptops running Microsoft Windows, making them popular in the education market but also with cost-conscious consumers and buisnesses. MSFT efforts in the past have focused on publicly ridiculing Chromebooks, but Microsoft has now decided to fight fire with fire by pushing cheap Windows laptops into the space. The Google Chrome operating system is a minimalist affair compared to Windows 8. 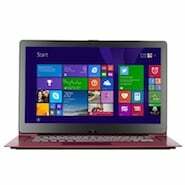 It lacks much of the functionality of Windows, doesn’t offer the same support for peripherals and its hardware requirements are minimal. In fact, many Chromebooks don’t even need the power of a CPU designed for PC use and can run on much lower-power mobile chips instead. There are no big software packages to install either, since everything is done online with Google Docs (or a small offline app version) so Chromebooks can also get away with a tiny hard drive (often just 16GB) for storage –and a Flash drive also gives them near “instant” startup. As a result of these specs and differences from a traditional laptop, Chromebooks can be had for $200 or less thanks to a reduced need for hardware. Microsoft was caught off guard by the demand for Chromebooks, assuming no-one would want a device with specs that looked like a 2008-era netbook and required an Internet connection for most tasks. And yes, Chromebooks had a slow start and an attempt to take them upscale (Google’s $1,299 Chromebook Pixel) went nowhere. But by 2013, manufacturers hit the sweet spot and inexpensive models like the Samsung (SSNLF) Series 3 Chromebook –a virtual clone in appearance to Apple’s (AAPL) MacBook Air– began to sell like hotcakes. In fact, Amazon (AMZN) said two of its three top-selling laptops over the Holiday season were Chromebooks. Microsoft’s response has been to mock Chromebooks and their deficiencies on its” Scroogled!” website, with plenty of links for visitors to easily buy “real” Windows laptops. That strategy hasn’t had any impact, however, and Chromebooks are only getting more popular. Gigaom’s Kevin C. Tofel reports that Dell (DELL) is experiencing such high demand for its Chromebooks it’s had to temporarily suspend sales to individuals to keep up with orders from educational customers. With Chromebooks showing no signs of falling out of favor, Microsoft is launching phase 2 of its attack, pushing Windows laptops that compete against Chromebooks on price. The Verge’s Tom Warren reports Microsoft announced a series of new cheap Windows laptops, including a $199 version from Hewlett-Packard (HPQ) that should be here in time for the holidays. Microsoft is cutting its Windows license fees, while manufacturers will be trimming hardware component costs in order to get prices down. The first of these cheap Windows laptops –an Acer priced at $249.99– is already being featured on Microsoft’s website. The appeal of going downmarket certainly isn’t to juice margins. It’s just a way for Microsoft to fend off competition. But even going cheap and simple is not without its challenges. When Apple cut corners to release a cheaper iMac to compete against the threat of Google Chrome machines in its education market stronghold, it was immediately apparent that the new machine was a step backwards. And that was after making relatively minor cuts like stepping down to a less expensive Core i5 CPU and trimming storage. Microsoft’s hardware partners are taking a much bigger blade to their cheap Windows laptops. For example, that Acer Aspire E3 currently being promoted on Microsoft’s website pairs a Celeron CPU with just 2GB of RAM and a 1366 x 768 display. This just satisfies Microsoft’s published minimum requirements for Windows laptops run Windows 8. By moving from Intel’s (INTC) Core series CPUs to Celeron processors that are significantly less powerful and trimming RAM and storage to the bone, there’s considerable risk these Windows laptops will disappoint users who buy them expecting the full Windows experience. Slashing costs by eliminating touchscreen capability also means saying good-bye to one of Windows 8.1’s big talking points: touch input. In short, by trying to race Chromebooks to the bottom on price, Microsoft could end up tainting public perception of Windows, Office and Windows laptops in general, giving those Chromebooks a boost instead of shutting them down. Will Cheap Windows Laptops Strategy Succeed? Microsoft has tried mocking Chromebooks and that didn’t work. Clearly, many of those who buy Chromebooks are doing so because of price. By offering cheap Windows laptops, Microsoft is likely to win over at least some of those people. But the Chromebook cost equation goes beyond hardware to include free apps, low maintenance and automatic security updates –a big part of the appeal to the education market. Having to pay for Office and the relative complexity of maintaining a Windows laptop may be harder to overcome than slashing hardware costs and will be a sore spot as Chromebooks begin to infiltrate the enterprise market as well. And if those cheap Windows laptops underperform, this race to the bottom on price may end up damaging the Windows brand. As of this writing Brad Moon doesn’t hold any securities mentioned here. Article printed from InvestorPlace Media, https://investorplace.com/2014/07/microsoft-msft-google-chromebook/.